Here we are again with another segment in our series on how to build your own power team. I hope you caught the last post in which I gave extensive details about how to choose, and how to work with, a property manager. If you missed it, check it out, it’s good. You’re not going to want to miss a single post in this series. Today, we’re going to jump in and talk about choosing the right closing agent. I’ve talked to many investors who tend to downplay the role of the closing agent. To be honest, this member of the power team can be crucial to your success. 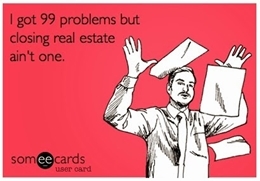 The closing agent on your team must have expertise in areas that are common only to real estate investors. A closing agent is the person charged with the coordination of several activities that are necessary for completing the sale of a real estate property. This person is responsible for ensuring that all documents and records are completed properly. He or she is also in charge of seeing to it that the funds are properly disbursed. Basically you could say the closing agent is a custodian. This is a role that can only be performed by a neutral party. Once you find a good one, take great care of them because they’re not easy to find. Double Closer: A good investor-friendly closing agent is going to allow double closings (also known as simultaneous closings). I don’t care if the first 10 closing agents you talk to say that double closings are illegal in your state – that is absolutely not true. I can say without a shadow of a doubt, it’s perfectly legal. Your job is to keep searching for a closing agent who has experience with this type of transaction. In addition, a good closing agent will understand creative investing techniques like wrap-around mortgages, subject-to transactions and creating notes. They should also give you an investor discount on the escrow fees. The typical investor discount is around 20%. There have been times when I had an important deal that needed extra attention, and my superstar closing agent handled it for me when I called her during non-business hours. Ask other successful investors who they use. Check out ads in the back of your local real estate investor association newsletters. Browse the local real estate investor association website for names and websites of closing agents. By taking this route, you are more likely to find a closing agent who is accustomed to working with the idiosyncrasies of real estate investors. You want a closing agent who has a good strong business, but who isn’t too busy to make you a priority when necessary. Your agent should be smart, open-minded and knowledgeable about how an investor thinks and does business. Don’t cut corners when finding your closing agent. Keep in mind you’re doing them a great favor, because you’ll eventually be bringing them a ton of deals to be closed on. Your main goal should be to become one of their top clients. I trust that after digesting all this information, you’ll never again take the role of the closing agent for granted. When you sit down at that closing table you don’t want to have to hope everything is in order. You want to be confident that it is. A top-notch, experienced closing agent is your secret weapon. We’re moving right along in building a great power team. In the next post, you’ll get a look at how to pick a real estate attorney. A real necessity to keep things legal.